I have a confession to make. I'm a little torn about this. Above is a screenshot from the Powderhounds website, a relatively popular site (catering mostly to Americans) the discusses the various ski resorts around the world. As you can see, Japan, South Africa, Canada, the USA, Europe, and New Zealand are the primary locations the site advises about. 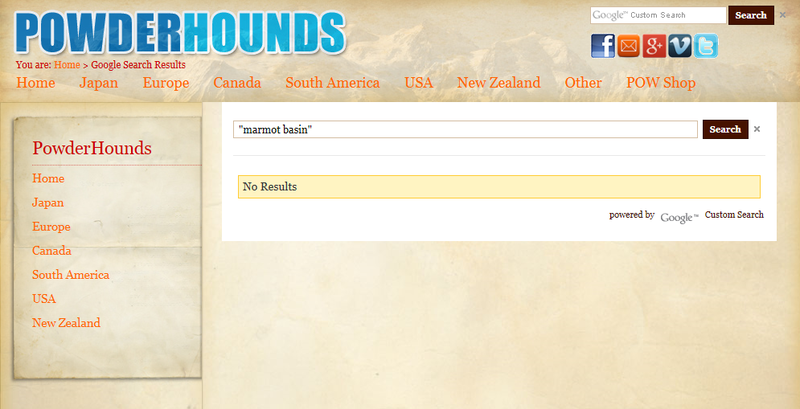 As you can also see, Jasper Alberta's Marmot Basin does not anywhere appear on the website. American skiers can learn all about the big resorts (like Whistler, Lake Louise, Fernie, Sunshine) and several of the smaller ones like Revelstoke, Kicking Horse, and Red Mountain). The casually mention the eastern ski resorts, only to laugh at them. But not a word is spoken about Jasper National Park's lone ski hill. In a way, it stings a little bit that Jasper is left out. The ski hill is a bit of a drive from Jasper, but there's a shuttle bus that goes to pretty much every hotel and at the end of the bus ride is a great medium-sized hill that features an 8-minute base-to-peak chairlift that Martok and I use to get three runs an hour in. Why wouldn't you want that? Also, unlike places like Fernie or Kicking Horse, you can get to Jasper from the U.S. without ever having to get a car. You can take the Greyhound (or VIA, if time is no object) from Edmonton to Jasper, stay in a Jasper hotel, take the shuttle bus to the hill, it's great. Fernie you can get to by Greyhound and stay on the hill, and there are shuttles from Calgary to Kicking Horse, sure, but Jasper has it all. It's a townsite so you can party all night (you can in Fernie too, but you have to travel between your hotel on the hill and the town), it's got all the restaurants and amenities you could want, and then you can go to a ski hill that never gets busy. Seriously, if you spend more than 5 minutes waiting to get onto a chairlift in Marmot you'll remember for months. In the same fashion, everybody who enjoys going to Jasper wants Jasper to be popular enough that the hill continues to have money to upgrade and improve the hill and have hot food and that hot bartender who makes famous Caesars at the Eagle Ridge Lodge. However if Jasper gets too popular then you're stuck waiting for your donair [they don't even make those anymore at Marmot. -ed] and you spend 8 minutes waiting in line for the Rocky Mountain Express (which itself only takes 8 minutes) and have to share a chairlift. So feel a little jilted that Marmot Basin isn't one of the Canadian ski resorts that people from around the world can find. Then enjoy that you can get to the bottom of the hill and get back on the chairlift without actually stopping.